Review: We Will Work With You! This is a wonderful exhibition, and is bound to fascinate every left-wing person interested in art and design, or just curious to see some of the history of the many social and political struggles from the past decades in Wellington. Some of the work and originality that the work building activist campaigns demands – in designing leaflets, getting out posters, thinking up slogans and songs – gives us just a little glimpse of the enormous wasted creativity of working people, creativity too often smothered or ignored in jobs where people are just ‘human resources’ towards profits. 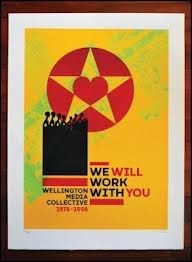 The Wellington Media Collective were a group of media workers who worked with – not for – campaigning and community groups between 1979 – 1998, helping produce posters, programmes, exhibitions, letterhead and images for trade unions, student groups, gay and lesbian organisations, Māori groups and more. Their work was beautiful and functional; it got messages out, and gave campaigns a distinct look and feel. The exhibition tells us that the Collective was ‘drawing on the model of post collectives that arose internationally in the 1960s and 1970s,’ but it’s the local stories that make this collection so interesting. Wandering through the gallery is like taking a walk into radical Wellington history: there are posters advertising the New Zealand Marxian Political Economy conference alongside fundraising calendars for anti-apartheid groups; lesbian and gay dances at Victoria University are advertised by beautifully colourful sheets while the Seafarers’ Union journal and the Red Fed Memoirs sit alongside papers and promotional material for student rights. There are many posters supporting the struggles of Māori for land rights and recognition of Te Reo Māori . The Media Collective presented a combination of radical politics and artistic beauty. There are many wonderful moments – a photo exhibition called ‘Women Under Capitalism’ from 1981 gives you documentary photographic glimpses of working-class life from 30 years ago while also offering a still relevant analysis of the intersection between sexism and the system. Some items are all too relevant. “Unemployed Workers! 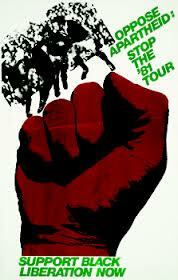 Unite and Organise!” one poster from 1980 announces. “Out of work – Demonstrate!” Our struggle continues. Make sure you see this informative, inspiring exhibition. It should encourage us to make our own history now. Details: WE WILL WORK WITH YOU! WELLINGTON MEDIA COLLECTIVE 1978-1998, 23 October – 21 December/22 January – 10 February 2013, Adam Art Gallery, Victoria University Wellington.